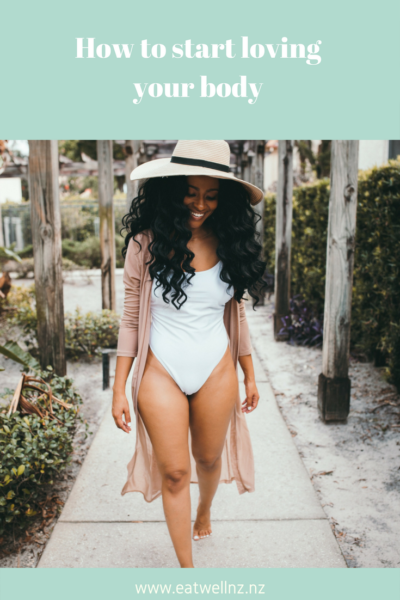 While the pursuit of an ‘ideal’ body is still very much out there in social media, there is a new, much more positive wave beginning to swell – body positivity. But how the heck do you begin to love your body when you just don’t?! Sure it sounds great and all, but when you’ve been doing the exact opposite for years, how do you start loving your body? Here’s the thing. You don’t have to love your body to start with. After all, it’s pretty hard to go from loathing your stomach or your thighs to look in the mirror and go ‘Ah I love it!’. Change doesn’t happen that fast and we can’t kid ourselves it will. So if you’re looking at all the messages out there that say ‘just love your body’ and think I will when I’ve just lost a bit more weight, it’s time to change your thinking. It is possible. To start loving your body as it is right now, you need the tools to do so. For years I spend a huge amount of time and energy trying to change my body. I thought it was terrible that my thighs touched (and this was even before a ‘thigh gap’ was a thing). I loathed my bum – I really thought it was repulsive. I’d wear body control pants, tie jerseys around my waist and bought the most super super flared jeans as the magazines all said they were great for balancing out big thighs. I didn’t do any exercise that might possibly make my thighs bigger. I religiously measured my thighs and bum each week hoping they’d be smaller. I can remember as a teenager going into the magazine shop to buy a Slimming magazine. The owner said to me “You don’t need to be buying these”. In my head I felt so ashamed thinking “Just wait till I turn around and see my bum and you’ll change your mind”. I then very carefully left the shop, trying to walk so my bum wouldn’t wobble too much. My body was almost always on my mind and I honestly thought there was something wrong with it. 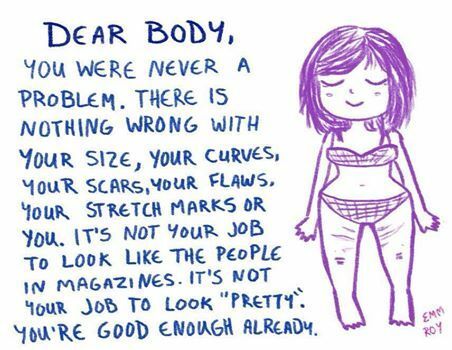 When you think your body is unacceptable the way it is, you see these thoughts as the valid truth. I really thought that there was something seriously wrong with how my body was and I couldn’t be happy until it changed. However they are only thoughts and feelings. Your thoughts and feelings are not evidence of facts. They’re simply thoughts and feelings. Today I’m completely comfortable in my body. Not because I lost weight. Not because my bum got smaller and I got a thigh gap. My body didn’t change. But my mindset, thoughts and feelings did. Somedays I still have ‘bad’ body image days, but I have the tools and mindset to bounce back. I do want to acknowledge that it is more challenging to accept a larger body in a society that praises thinness and sees a larger body as something that should be changed. 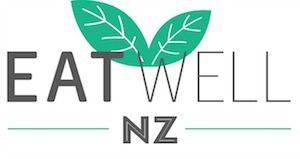 One of my fave NZ bloggers who talks a lot about learning to be more positive about her body is Meagan Kerr. You can check her blog out here. So how do you start to be more comfortable in the body you’re in? First things first is to move the goal post. If it feels impossible to ‘love yourself’ right now, let’s at least be neutral about how we look. When you catch yourself thinking or saying emotionally charged statements about your body, change them to be less emotional and more neutral. Think of it as more of statement instead of a judgement. For example instead of saying ” My stomach is big and disgusting” switch it to “My stomach is rounded”. The more we nip these mean thoughts about ourselves in the bud, the easier it becomes to accept the way we are today. Try to talk to yourself with the kindness you would to a friend or family member. Focus on what your body can do for you rather than the size or shape of it. For example change “I hate my fat legs” to “My legs carry me round each day so I can do my job in retail” or something fitting for you. Society places so much focus on having the ‘perfect’ body. But in reality, a ‘perfect’ body doesn’t actually exist and it certainly doesn’t mean a perfect life. 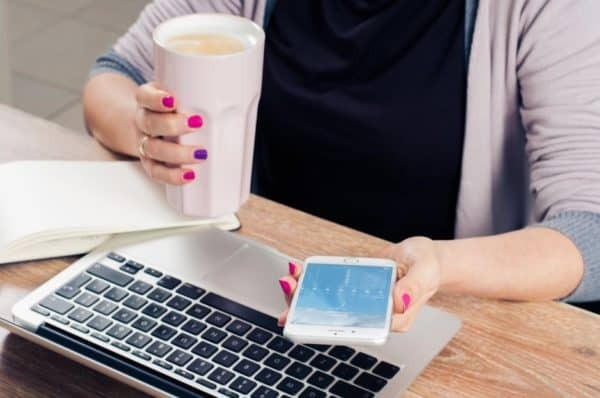 There have been many examples shared on social media when striving to look a certain way leads to disordered eating behaviours, stress and anxiety around appearance and medical issues as well. We can’t change our genetics, we can’t change our body shape or our ‘set point’ weight. Your body is your ideal body. It provides the vehicle for you to live your life. We’re not play dough but we do seem to try and mould our body with diet and exercise like it is! Instead, exercise and eat for well-being. To gain a better body image, it pays to surround yourself with the messages you’re trying to tell yourself, rather than images that trigger thoughts of body dissatisfaction. If you have a larger body, it can be a little more tricky to love yourself when all you see is slim bodies. But by surrounding yourself with positive messages and noticing the diversity of bodies, it becomes more apparent that there ARE lots of different shapes and sizes out there. Sometimes taking a step back from analysing all your perceived bodily flaws is also useful. We’re not a list of flaws. Our bodies are a whole. You might like some things more than others and that’s ok, but remember you’re not just a part of your body. Does it really matter if your thighs touch? Is it super important to enjoying life that you rid your belly of a roll or two? Try to put aside these thoughts and live life in the body you have right now. When you’re old and reflecting on life, do you think you’ll be pleased that you didn’t go swimming at the beach with your kids because you didn’t have a flat stomach? Or will you regret that you just didn’t enjoy time with the kids in the cool ocean, feeling the waves splashing against you? Do you think that years of deprivation trying to get the ‘perfect body’ will be remembered as worth it, or a waste time when you could have spent your energy elsewhere? It’s easy to feel like you need to live up to societies expectations of what you should look like. But health doesn’t come in one size and neither do bodies. Take a deep breath, try to relax and realise you are ok.
Love is a far greater motivator than hate, so being kind to yourself and your body doesn’t mean you’re ‘giving up’ on yourself. Do the best with your body you have today – nourish it, treat it right, dress it in a way that makes you feel good rather than waiting to reach a certain shape or weight. 3. Start to think about what your body allows you to do. After all, it’s basically the shell for living your life! Instead of basing your self worth on how you appear on the outside, think about what makes you you and what your body can do for you. Do you love walking? Yoga? Your body allows you to do those things. What things are you proud of? 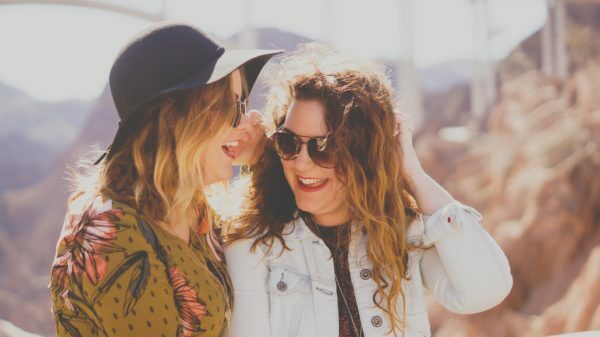 Are you a great friend/sister/mother? Can you bake an amazing chocolate cake or whip up a mouthwatering curry? These are all things that make you special, no matter what you look like. Find your self worth in what you do, not what you look like. The journey to being ok with your body takes time. But each little step you take, each bad body image thought you squash, the closer you get to being able to say ‘I love my body’.